My buddies and fellow photographers, Guy Tal and Bruce Hucko, and I made a deal. We were to meet in Torrey at 2:00 pm on a Thursday for a multi-day wandering together to discuss the future of the Moab Photo Symposium (it’s a GO for 2015! Mark your calendars for April 30 – May 2!). After agreeing to these arrangements, I did some math. I would need to leave my home in Chandler at about 4:00 am in order to make the 550-mile, 9-hour run (plus an hour time change in Utah) within the set deadline. Not being a morning person, if I am getting up at that hour, I would really like to have a camera in one hand and an encouraging cup of black tea in the other. With that, I pondered leaving on Wednesday and making an overnight stop at a scenic location en route. Plenty of spots entered my thoughts, but one stuck in my mind: Toroweap along the north rim of the Grand Canyon. Despite it being high on my photographic “to see” list for years, I had never been to this iconic place before. Most people shy away from this remote location in July due to the scorching 100-degree-plus temperatures. However, the promise of solitude made it the perfect choice for me for a quick stopover. I could photograph at sunset and then again sunrise before getting back on the road no later than 6:30 am to reach Torrey on time. On paper, it seemed like a lot of driving to sneak in such a short stay. Nonetheless, I simply wanted to finally see Toroweap with my own eyes. Now was the time. After suggesting to Guy and Bruce that I would be making the trek from Toroweap, and apologizing in advanced for potentially arriving late, I received a quick response: For every half hour I was late, I would owe them each a beer. Fair enough, deal. Despite warnings about difficult driving conditions, I felt as if I was driving on the dirt Autobahn for the first 45 miles or so when compared to other backcountry roads I had driven before (like Alstrom Point above Lake Powell and the Racetrack in Death Valley National Park). As each uranium mine semi-truck, and presumably other visitors, whizzed by me from the opposite direction, I felt solitude on the canyon’s rim coming closer. When I spotted an SUV turn onto “my” road from the Colorado City route, slight disappointment kicked in, as I knew they too were heading to Toroweap (there are only so many roads out there). On the bright side, if I had any trouble along the way, they would eventually run to me as they retraced their steps. As I approached the national park boundary, I heard a sudden “DING-DING-DING!” A message popped up on my truck’s dash: Right rear tire: low air pressure. Slowing down from 20 mph, my eyes widened as I studied the monitor as the air pressure plummeted: 70 psi to 60 to 55 to 43 to 24. I never saw or heard the culprit, but the hissing sound became abruptly and painfully loud, as I my emotions spilled, “Oh no. No. No. NONONONONONO! Not here, not now! Wake up, bad dream!” I swore at myself for acting overconfident on the first part of the trip: karma will always find you, I reminded myself. I had never changed a tire before in my life. My husband, Craig, and I talked just earlier this year about practicing in the comforts of our driveway, but that plan had not yet come to fruition. Too late now. I realize I am not the first person on the planet to ever change a tire. But the prospect of learning how to do it on my own while solidly 55 miles away from civilization as mammatus clouds collected overhead and thunder rumbled down the valley, well, it made me sick to my stomach. 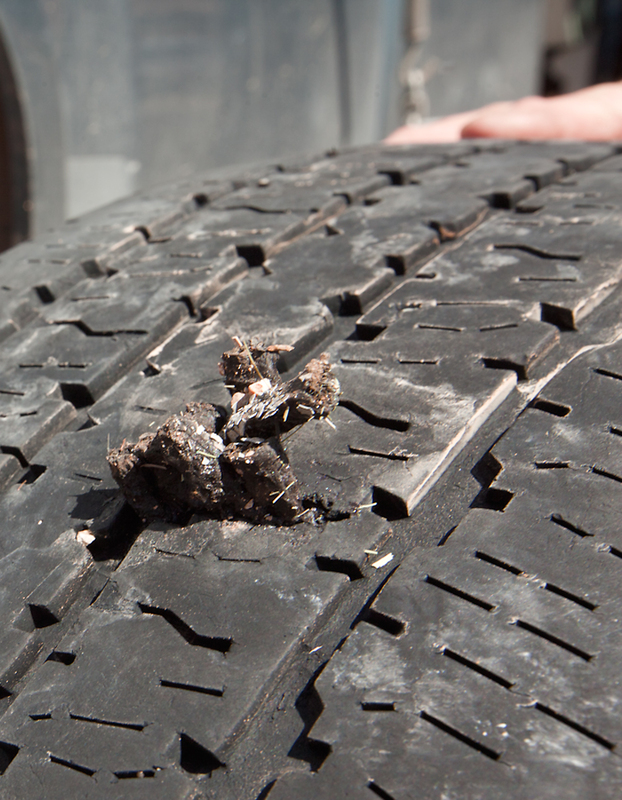 As the distant sky crackled, I dropped the spare from underneath the truck. Checking the first step off the list gave me some hope…and an idea. I decided to photograph a time-lapse sequence to document this momentous occasion in my life on the road. Taking a short break from tire-changing, I positioned my camera and wide-angle lens on a tripod with an intervolumeter set to fire every five seconds. (And now in my first ever attempt at putting together a time-lapse – lots to learn there! – you too can laugh at the hilarity that ensued condensed in four and a half minutes…). For almost an hour (unbeknownst to me in the field, but confirmed via timestamp from my photographs), I danced around to figure out where the jack was, how to unscrew the bolts, and reattach the rim facade to secure the spare onto my truck. As time passed, the storm darkened the sky and brought the thunder closer (each time thunder boomed, I looked up to judge how far away the cell was, which you’ll see in the timelapse). I explained I was heading to Toroweap, but with no spare tire and the most challenging part of the road ahead, I shared that I was contemplating heading back to Kanab immediately. I absolutely must be in Torrey, Utah by 2 pm tomorrow afternoon! “Oh, I don’t know about that,” I replied with much trepidation. “You gotta see it. You’ve come this far. There’s no use turning back now,” Larry encouraged. I anxiously crept along the now high-clearance four-wheel drive track, taking almost an hour and a half to travel the remaining and mere 6.3 miles (it’s entirely possible I could have walked the same length in less time). Upon reaching the end of the road, I parked, grabbed my photography gear, and sprinted to the edge. 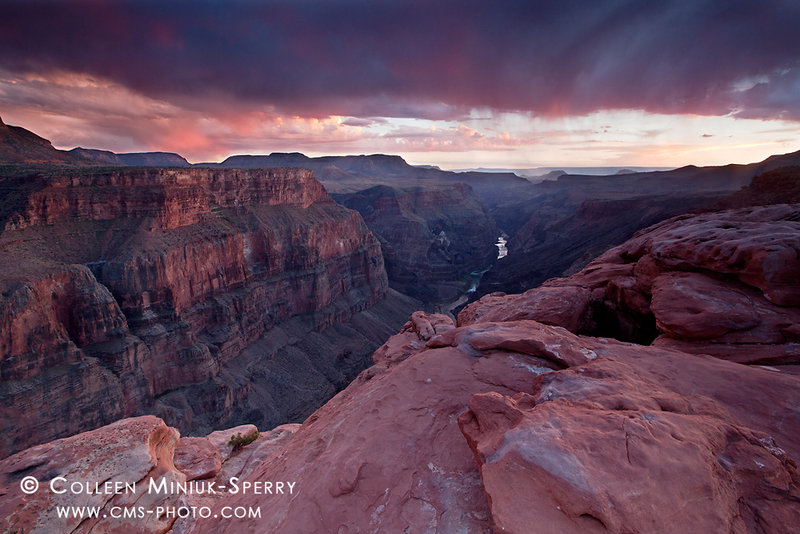 I reached the rim and made my first image of the canyon at 7:46 p.m. 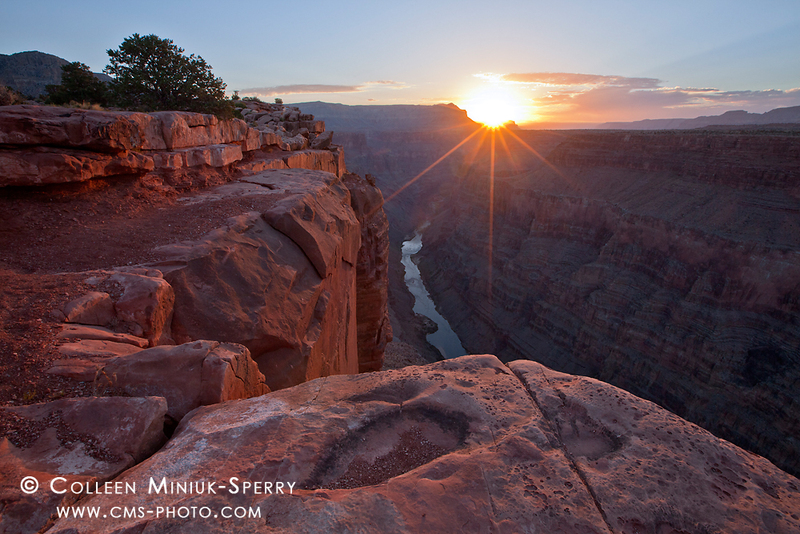 The sun dropped below the horizon and the canyon into shadow at 7:51 p.m. I stood above the abyss until I could not see it anymore, partly to soak in as much as I could, and partly to delay driving the extremely rough 0.9-mile drive back to the campground. A thirty-minute crawl landed me in a campsite, directly next to the same car I had been disappointed to see ahead of me earlier in the afternoon. I was too wound up to make new friends with the five German gentleman – the only other group in camp – but their presence alone brought a sense of calm over me. My 4 a.m. alarm buzzed seemingly immediately after I laid my head down on the pillow. Beneath a star-filled sky, I returned to the overlook to enjoy the scene in a new light. As I set-up my composition in the twilight, I heard two voices approaching, one distinctively female. How could that be? The pair casually walked up to the rim and said a cheery, “Good morning!” in a British accent. Though our pleasant exchange, I learned they had abandoned their two-wheel drive sedan “somewhere along the road” and walked through a good portion of the night without headlamps or flashlights (under a sliver of a crescent moon) so they could arrive in time for sunrise. And they did so with 15 minutes to spare. Impressive. The sun’s morning rays bathed the canyon in rich, warm light, exposing new cracks and crannies in the geological wonder I hadn’t seen the night before. It’s cliché to say about a cliché place, but I’ll say it anyway: words can hardly describe the grandeur rolled out in front of me. At that moment, I knew Larry was right. I had to see this. Within my mere 10-hour stay (way too brief to fully absorb and appreciate the scene), I recorded 96 frames total, four of which I will keep, even though I frantically composed them all and they are not anything anyone has not already produced or seen from this spot. Here’s the thing, it wasn’t (nor is it ever) about “snagging” photographs. Actually, I couldn’t have cared less about making an image other than to document that I had reached my destination. I simply wanted to stand at the edge of the canyon, breathe the fresh air, and marvel at Mother Nature’s work. I smiled and thanked Larry silently in my head. I saw it, and it made me feel alive. With my 2 p.m. deadline looming in the back of my mind, I packed up my equipment and searched for the couple from London. When I found them, I offered them a ride back to their vehicle, which was no doubt along the route back to the ranger station. They enthusiastically accepted. The travel bug had bitten these two youngsters, Natalie and Hansa (I hope I’m spelling his name correctly! ), much in the way it had munched me. Both had once taken on unfulfilling jobs, only to leave and then gain what they valued most: time. And in that time, the chance see the world. In their multi-week stay thus far, they had seen more sights in the United States than most Americans see in their lifetime. They were already making plans to take on temporary jobs back home to save just enough money to enable their return. As I pulled next to their car (about three miles from the overlook), we agreed, so much to see, so little time. With Natalie and Hansa following me, I arrived at the ranger station at 6:50 a.m. to meet Larry and reclaim my tire. The tails of six plugs spewed from my tire like a jester’s hat. Larry lifted it into the front seat of my car and assured me I would have no trouble using it as a spare on the way back to Kanab, if needed. I couldn’t thank him enough. After well-wishes and heartfelt goodbyes to Larry, Natalie, and Hansa, I returned to Kanab where the good people at Ramsay’s promoted my original spare into full time service on my truck and sold me a new spare.